Mariana Niembro is creating a new culture in Mexican politics by harnessing innovative digital tools to increase transparency & strengthen democracy. Mariana Niembro is creating a new culture in Mexican politics by harnessing innovative digital tools to increase transparency, strengthen democracy and bring politicians closer to the people they represent. Mariana's New Idea: By providing mechanisms that hold politicians accountable and by offering information and tools that enable citizens to actively participate in democracy, Mariana creates a behavior change in politicians, institutions, and citizens. Through her organization, Borde Político (“Political Border”), she is creating a new culture around politics and challenging the common mindset that politicians are all corrupt. She enables citizens to judge their representatives based on their performance and results, which pushes politicians to change their roles and how they interact with civil society. Mariana uses online tools such as the “Borde Score,” which evaluates all 628 members of Congress on a 100-point scale, and the “Incorruptible” app where citizens can expose corrupt activity. She also strategizes with citizen sector organizations (CSOs) to best position their social agendas and craft well-designed online storytelling campaigns that show that change is possible and persuade citizens to move from apathy to action. Mariana’s impact can be seen in several ways; several legislators approached Borde to learn how to improve their Borde Score and more and more politicians have since made their work more transparent by using open data, making important decisions in committees and not behind closed doors, and considering citizen opinion when voting. Borde has established national reach as a source of quality political information for citizens, media, civil society, and politicians. 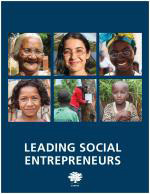 Mariana' s story appears in the 2018 edition of "Leading Social Entrepreneurs" which features a selection of just a few of the Ashoka Fellows recently brought into the largest global network of social entrepreneurs. The LSE presents some of the newest innovations by leading social entrepreneurs whose ideas are changing the way things are done all over the world.